I’ve tried several organic and green mascaras and most of them are horrible. They flake, they smudge they do nothing to enhance my lashes. I had given up and resigned myself to using conventional mascaras forever, because the quest to find a green one felt futile. That was until now. 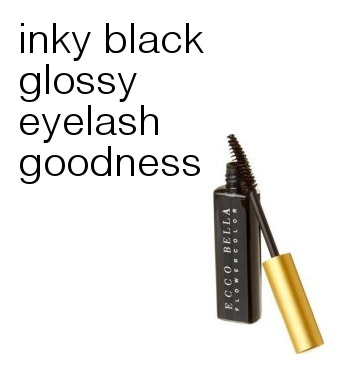 This mascara by Eco Bella, is hands down the best mascara out there. It does not clump or flake, two of my biggest pet peeves with mascara. And while it does not provide big lash drama, it does lengthen and when used with an eyelash curler. The results are just awesome. My favorite thing about this mascara though is that it really coats your lashes with the deepest, darkest black. Its just so inky, I really love it. The trick with this mascara is that you have to let it dry, no rubbing your eyes or anything immediately after putting it on or it will smudge. But thats a small price to pay for green mascara that actually works in all of its inky black goodness.